One of the scoby I adopted started growing mold. I'm down to the one that I split way before the mold but fear it may be too old as per the other article. I'm trying to coax a baby from it. 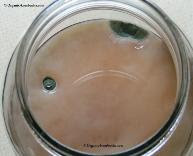 definitely try growing a baby SCOBY from your old mushroom! good luck! I'm brewing my first Kombucha. 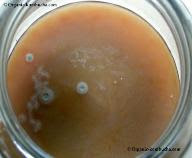 After a week of rather cool weather (50sF) I checked the container and found a thin layer of mold on top of the brew. I pulled it out with tongs, tasted the brew which was not as fizzy as the ones I've purchased. I left it and checked it 2 days later - no more mold - tasted again... no fizz - more like cold sweet tea. Can I use this mother again or must I use a new one? I got two from a friend. If this one is no good is it likely the second is bad too? The second one is in the fridge. Thanks for the comment, and my apologies for the very late reply. As I mentioned in the post, use the mushroom or not at your own discretion. You can always try to use the mushroom to see if the brewing is successful, but just be cautious. If the mushroom doesn't work out, luckily you have another one in storage! If you don't feel comfortable using that mushroom again, Happy Herbalist recommends "if in doubt, throw it out." To read more about their take on mold, check out their links that I provided at the end of the post.